I followed your instructions and I got what I wanted thank you. Now, I want to do some analysis to the rock slope data and I not sure if that's even a RockWorks ability. Can you tell me if that´s a possibility, I'm not finding anything. Are you thinking of something like RockPack III? I'm working at my university and I don't know if I have access to other programs other than RockWorks at the moment. Can't RockWorks do any type of analysis, even if it is simpler than rockpack? You can plot up stereonets and a variety of maps showing strucutral data, but we do not have anything pertaining to safety factors and failure prediction. 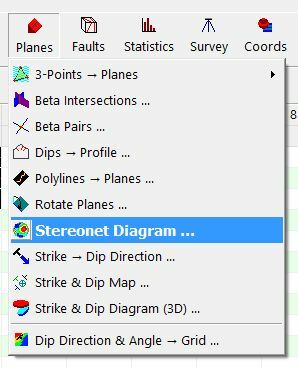 Here are the options in the "Planes" category.